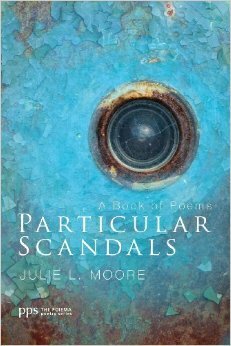 Particular Scandals, Julie L. Moore’s second full-length collection, is a book about faith and trust, family and nature, the glory and horror of each of those things. The speaker’s faith here is informed and open-eyed and subject to interrogation. The speaker celebrates her family members but also acknowledges loss. Creatures and plants enter the poems as they often do our lives, evoking our awe but also warning us away. Addressing these topics, a less capable or less honest poet would have defaulted to the romantic or perhaps surrendered to rage; Moore chooses instead to stand her ground, turning away from neither beauty nor pain. From this perspective, the two most thematically significant poems are the opening one, “Amen and Amen,” and the ten-part title poem, “Particular Scandals.” In “Amen and Amen,” the speaker sits outside as night descends, listening to her daughter “playing the piano, / singing Cohen’s Hallelujah, / her voice rising, the keys / stirring sparrows in pine trees and maples.” This particular song, of course, stirs many listeners—and the temptation for the writer could be to hope the evocative force of Cohen’s art would carry the emotional weight of the poem. But in the next stanza, Moore veers away from, even undercuts, “Hallelujah”: “but I’m reading O’Connor, considering displaced / persons, the ungodly ways we ruin one another.” The poem then lists several ways contemporary American social forces have “ruin[ed] one another” before shifting focus to monarch butterflies and their poisonous defenses. Here she again briefly evokes Cohen: “how terrible they taste. Hallelujah.” Then the speaker turns to her own physical pain before returning, finally, a dozen stanzas after introducing her daughter’s music, to that haunting song: “Ashley sings on, as though her breath’s / no longer her own, absorbed now / in benediction. Our amen un- // broken, like a world without end.” Moore isn’t simply rehearsing or commenting on Cohen—she has expanded the effect of the song by applying it to a new, unanticipated context. The concluding lines of the poem are particularly effective. I am usually not a fan of hyphenating words at line breaks because so often the motive is simple linguistic cleverness. Here, though, the last line acquires an entirely new, and challenging, meaning: “broken, like a world without end.” The world continues because it is broken, even if the “amen” itself is unbroken. Which is worse, to refuse divinity as a response to pain, or to ignore it in the presence of beauty? I admire the presentation of a mind thinking in this poem, and I also admire the disruptive effects of some of the section breaks. Thought staggers in this poem before it comes to its resolution, as our thinking often lurches about before we reach clearness. The central idea of this poem isn’t new—human beings have been cursing and questioning and praising God for millennia—but Moore has made it new through her attention to concrete imagery as well as the rhythm of the poem’s development. Finally, I also want to state that Particular Scandals is thoughtfully constructed as a collection, with the poems often arranged to enhance the meaning of those that surround them. “Christmas Stillborn,” for instance, is followed by “What We Heard on Christmas Day,” such that anticipant waiting becomes ironic even if nevertheless faithful. The next poem is “Wonder,” addressed to the incarnated infant Jesus. Because of the arrangement, we cannot read about the “wonder” of incarnation without recalling the infant who did not breathe in “Christmas Stillborn,” a poem that concludes with lines that look forward to the poems that follow: “We wonder at the grave / of our anticipation.” Individually and collectively, the poems in Particular Scandals reward slow, close reading. This entry was posted in A Review A Week on October 15, 2014 by Lynn Domina.